1Press the Menu button and then display the Retouch menu. 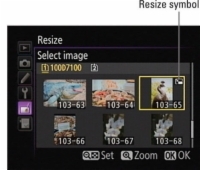 Select the Resize option, as shown on the left, and then press OK. You see the screen shown on the right. 2If two memory cards are installed, select Choose Destination and then select which card you want to use to store the resized images. Select Choose Size to choose the size for the small copies. 3Choose Select Image and then press OK to display thumbnails of all your pictures. An X over a thumbnail means that the picture can’t be resized. You can’t resize movie files, for example, or already resized images. 4Move the yellow highlight box over a thumbnail and press the ISO button to tag the photo for resizing. You see a resize icon in the top-right corner of the thumbnail. Press the button again to remove the tag. 5After selecting all your pictures, press OK. Highlight Yes and press OK once more. 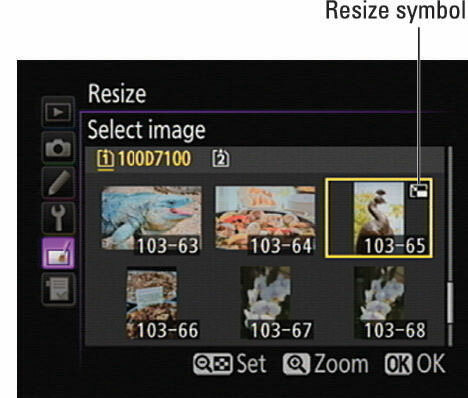 Resized photos appear with the Retouch and Resize symbols.